Alright, I’m using “sun-dried” very loosely here, as these little beauties are not…well…sun-dried at all. 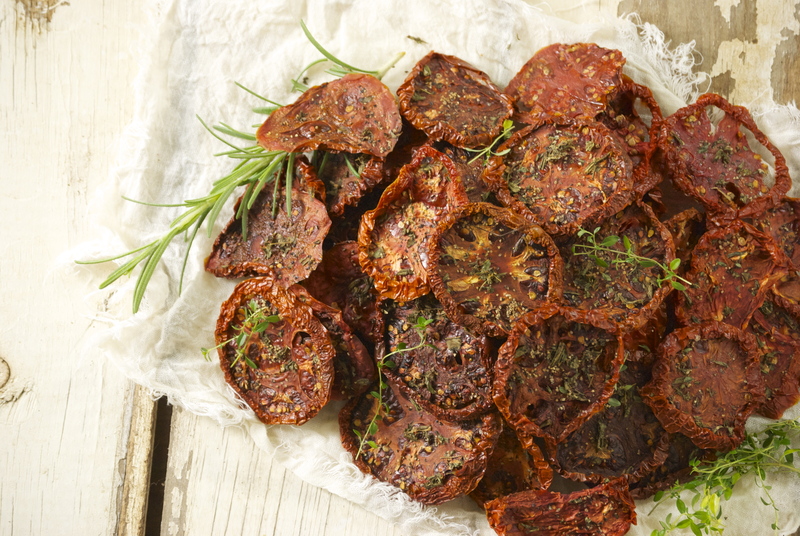 I just couldn’t bring myself to call these “sitting on a counter in a dehydrator” tomatoes. No, I like to imagine that they were patiently crafted in Italy, with tables upon tables of tomatoes laying out in the sun, as I sipped a Chianti and and read a good book. Alas, my reality is Minnesota, and I used a food dehydrator. Not quite as romantic, is it? Even so, these tomatoes are fantastic, and seriously recommend you give making them a try. I love having a nice supply of sun-dried tomatoes to get me through the winter. Buying jarred versions at the market can be expensive, and to be honest, they’re just so simple to make. You can use any type of tomato, though smaller ones will require less cooking time. Roma’s are a fantastic choice– simply cut them in half or quarters. 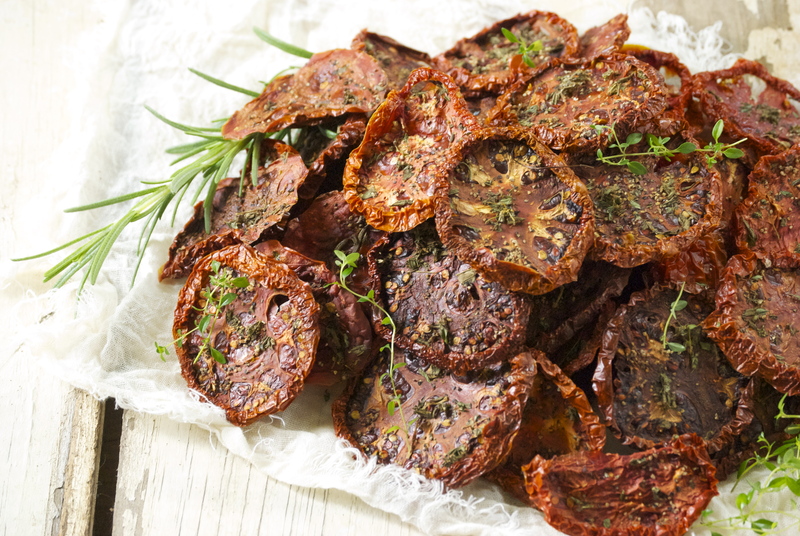 The tomatoes take time to dehydrate– perhaps a day or more for the thicker end pieces. I sprinkle mine with rosemary, thyme, with a little sea salt and cracked black pepper. The flavors are wonderful! You can snack on them as soon as they’re dried, or preserve them to use later. As for the texture, some like them a bit chewier– I made sure mine were completely dry since I intended to preserve them. It’s really up to you how dry you want them to be. These tomatoes can be kept in airtight containers (plastic bags work well), vacuum sealed, or even stored in the freezer. 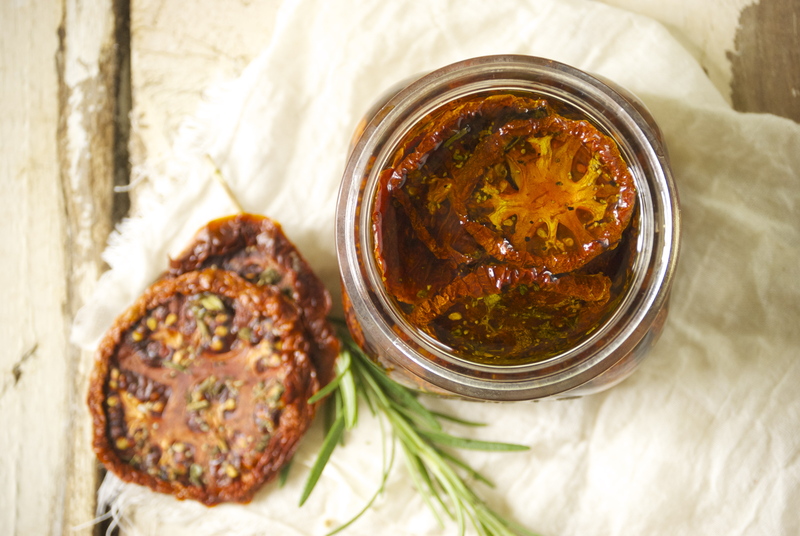 I also made a jar of sun-dried tomatoes in olive oil, and they are ridiculously delicious. These would make fabulous gifts around the holidays if you’re looking for something homemade to share. I hope you give these a try! To Dehydrate the Tomatoes: Slice the tomatoes or half them, depending upon their size. Sprinkle with the chopped herbs, salt and pepper. 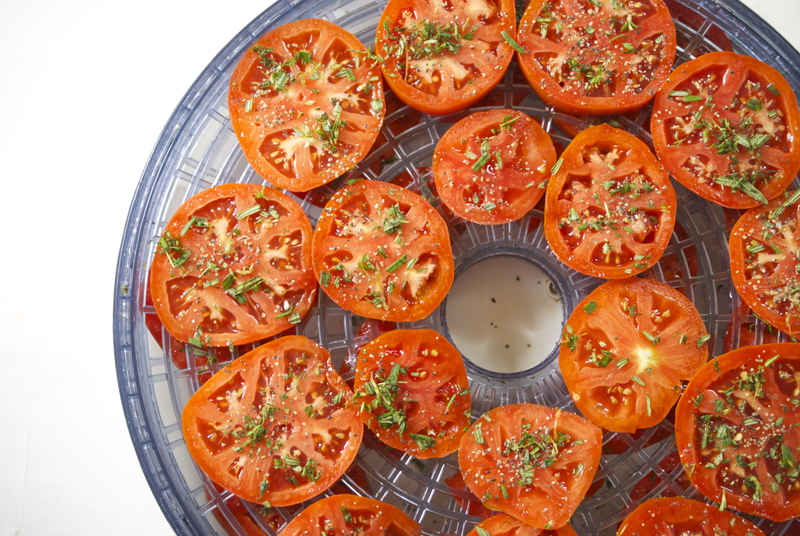 It will take about 24 hours to dehydrate a full load, sometimes longer depending upon how thick the tomatoes are sliced. Store in a resealable bag and use within a few weeks. Freeze any amount you want to keep longer. To Oven-Dry them: Preheat oven to 200°F. Slice tomatoes and sprinkle with chopped herbs, salt and pepper. Place on a large baking sheet lined with parchment paper. It will generally take between 2-6 hours (possibly more) to dry the tomatoes– much will depend upon how thickly they are sliced. Store in a resealable bag and use within a few weeks. Freeze any amount you want to keep longer. 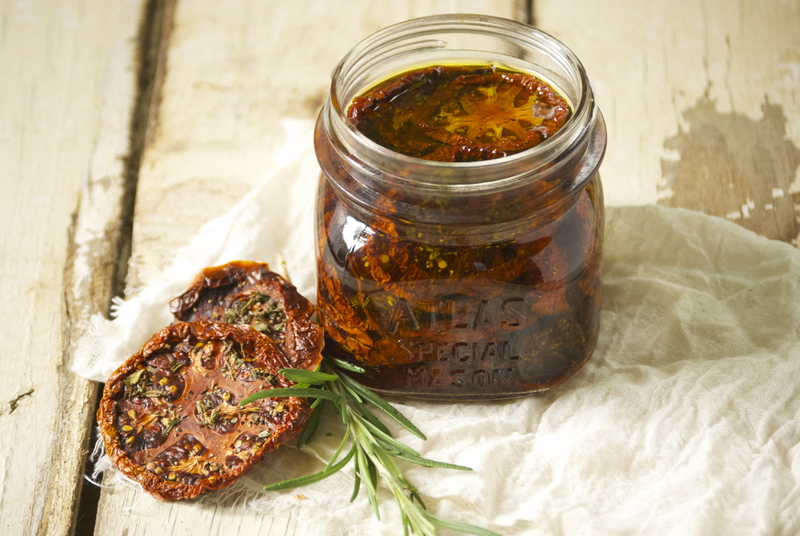 To make Sun-Dried Tomatoes in Olive Oil: Prepare dehydrated tomatoes by dipping them in white wine vinegar (this help keep bacterial growth from occuring) and shaking off any excess. Place in a small jar along with 1/2 cup of red wine vinegar. Then fill the jar up with olive oil. Make sure that all of the tomatoes are submerged. Store in the refrigerator and try to use within 2 weeks. If placing fresh herbs or garlic into your mix, you must use up the jar within 1 week. The olive oil will become hard in the refrigerator, simple let sit at room temperature for a few minutes before using. Be mindful to use clean utensils when removing the tomatoes from the jar.